It’s been a long time coming, but on Tuesday Tesla finally lifted the lid on the Model X, its six (or seven) seater electric SUV. Given that the concept version of the Model X made its first appearance all the way back in 2012, it’s a little surprising it’s taken so long for the disruptive car-maker to unveil a production model. Then again, Tesla has a reputation for obsessing over small, but crucial details, so it’s unlikely that the delays are anything to be overly concerned about. Still, Tesla’s aim with the Model X was to build nothing less than “the safest, fastest and most capable sport utility vehicle in history”, so all that time and effort had better pay off. According to Tesla, the Model X comes standard with all-wheel drive, has a 90 kWh battery providing 250 miles (around 400km) of range, and can get from zero to 100km/h in a shade over three seconds. At 0.24, Tesla claims that the Model X’s drag coefficient is 20% lower than the next best SUV. Aiding that efficiency is an active spoiler which deploys to one of three preset positions when Model X is in motion, “optimising visibility, highway efficiency and stability”. Impressive as those figures are, none of them are likely to be the first thing people notice about the Model X. 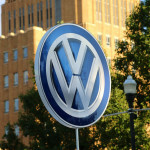 On their own, they probably wouldn’t be enough to draw high-income drivers away from their current fossil-fuel burning. And that might just explain why Tesla stuck a pair of stonking great “Falcon Wing” doors on the Model X. Of course, no one from the company would ever admit as much. Instead, it says, the doors “allow easy access to second and third row seats from any parking space”. According to Tesla, the doors need just over 30cm of clearance to be effective, giving them a distinct advantage over more conventional car doors, as well as minivan style sliding doors. The company also claims that the door design allows passengers in both the middle and back rows to enter the car simultaneously. And once all those passengers have entered, it says, they won’t exactly be battling for room. 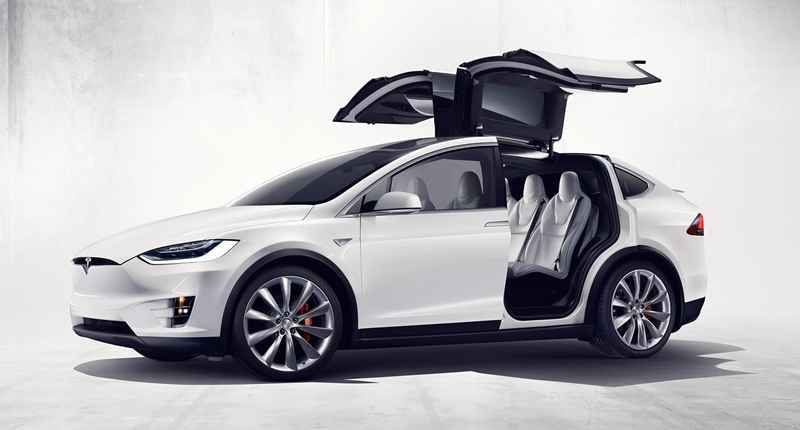 The Model X comes with configurations for six or seven seats. Which configuration you choose largely depends on whether you’re more concerned with maximising passenger or luggage capacity. The second row seats are mounted on a single impact absorbing post and independently reclining. Tesla claims that each second row seat is designed to maximize passenger comfort, legroom, under seat storage and access to the third row. That’s a pretty big claim to make, but it’s pretty obvious that we’ve come a long way since the launch of the first Renault Espace. The third row seats fold flat when not in use. When it comes to safety, Tesla seems to have put some serious thought into the Model X. The floor-mounted battery, for instance, is meant to lower the center of gravity so that the risk of rollover is almost nonexistent. 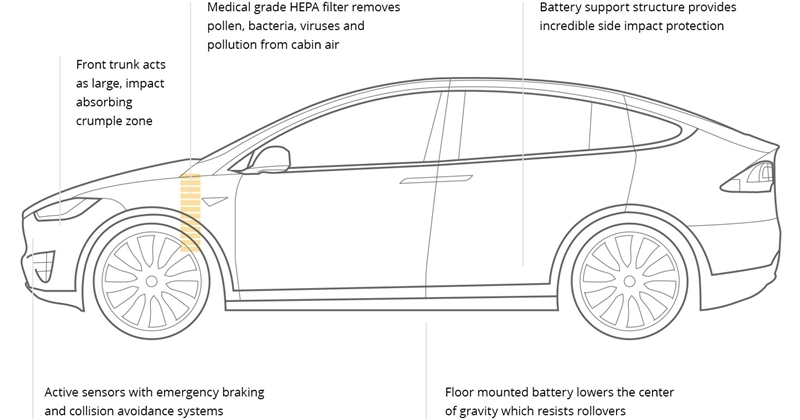 According to Tesla “the battery structure strengthens Model X against side impact intrusions. And without a gasoline engine, the large front trunk acts as a giant impact-absorbing crumple zone”. Combine those features with the Model X’s camera, sonar, radar systems, and automatic emergency brake deployment and it starts to seem like you’d have to try pretty hard to crash the Model X. While Tesla hasn’t released exact pricing, it seems that the P90D “Signature Series” launch version with a 90kWh battery will start at about US$132 000 or US$142 000 with the ‘Ludicrous Speed Package’.